To the GMV spotter, an ESS can most easily be identified by the ESS badging on the front fenders, the blacked-out exterior trim, special ESS headrests, and an interior trim code (on the Ford Dataplate located on the driver’s door) starting with “P” denoting "Performance Bucket Seats." 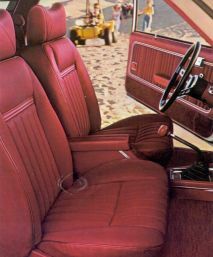 Although no other 1978-80 Granada has such a trim code, it should be noted, however, that not all ESS Granadas were equipped with the Performance Bucket Seats and therefore, may have a different trim code. Standard engine is the 4.1 litre (250 CID) Six with 4-speed manual overdrive transmission. Options include 5.0 litre (302 CID) V-8 and SelectShift, the 3-speed automatic transmission that lets you shift manually when you like. For thousands less than what you could spend for some European cars, you can have in ESS a roomy and comfortable 5-passenger sedan (2-door or 4-door), smartly European in styling from its blackout grille to its tricolor taillights. Black windshield wipers, window frames, bodyside moldings (with bright inserts), rocker panels and back panel appliqués. Louvered opera window appliqués (2-door), hood and decklid paint stripes, dual sport remote control mirrors (finished in body color). Color-keyed wheel covers. Wide wheel lip moldings. 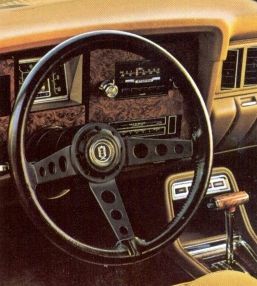 In the photo album below are pictures of the 1978-80 Granada ESS's which have been identified and registered. 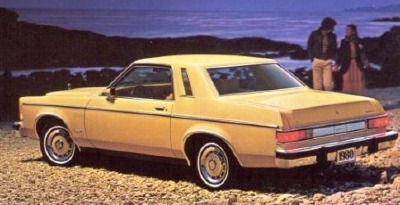 These rare beauties also appear on the main 1978-80 Granada pages.